Inspired by Sew Mama Sew's Giveaway Day and by the joy I see on my kids' faces when Nikolaus arrives, I had a Nikolaus Giveaway on my blog. 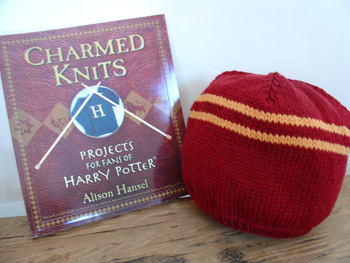 One lucky reader won a house hat of their choice, hand knit by me, along with a copy of my book, Charmed Knits . I used Cascade 220 (my old friend!) and finished the Gryffindor beanie as the first project of the new year. What a great way to start a year of knitting!